I don't usually write about what we get delivered at Variety when we work late on Wednesday nights...it generally ranges from just ok to positively dismal. But this week, things took a major turn for the better when Auntie Em's catered our Wednesday night buffet. 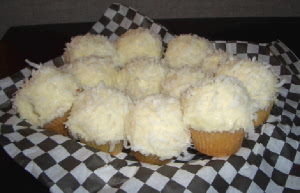 Those mini coconut cupcakes in the picture achieved cupcake godhead -- more so than Em's usual larger size. The proportion of cake to frosting was more ideal, although they caused the same sugar rush. People were hoarding the mini red velvet ones as well. We also enjoyed the skirt steak, stuffed chicken and mac 'n cheese. What an improvement! My housemate works for Auntie Em's and introduced me to those cupcakes. It's good stuff, and all their baked goods have gotten a lot better. I love a good cupcake, but I generally have to make them myself to be satisfied. The frosting is usually a cupcake's downfall, and I think theirs is better than most (though they tend to put a little too much on the big ones, I think). What are your thoughts on Sprinkles Cupcakes in Beverly Hills? I think they're pretty good, but I'm not sure if they're worth all the hype. I didn't care that much for Sprinkles, they seemed too sweet and bland. For some reason I like the ones at Toast, even though they seem very loving-hand-at-home. But maybe that's why they're good. I'm admittedly intimidated by the gargantuan size of Auntie Em's cupcakes, so your mini-report has me very excited. As far as a working meal of skirt steak, stuffed chicken, mac 'n cheese and the afore mentioned cupcakes goes - oh, my, I'm not sure how productive I would be. But what a lovely way to go out. I second your (Pat's) comment on Sprinkles. My personal experience has been that they are all hype and little flavor. I think I have to agree with both of you regarding Sprinkles. So far I've been the only person I know to question their grandeur so it's nice to know I'm not alone. I enjoyed their banana cupcakes, but after eating one I realized I would have preferred it without the frosting... and even later realized I would have preferred a good fresh-baked loaf of banana bread. I'll have to try Toast's next time I'm there. I like the place quite a bit, but the waits have become unbearable in the last year or so. i concur on sprinkles. too sweet. not all that. i got 40 of them for my bd party. some guests raved. i just didn't get it. hi!i haven't tried auntie em's but they are sure on my list. i was just in burbank and had Yummy Cupcakes.... delightfully yummy. If I didn't feel the guilt, I'd eat 1 a day!